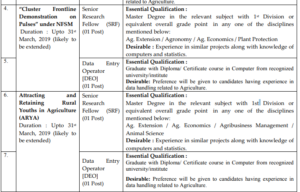 ICAR ATARI Recruitment 2018: Research Associate, DEO, Young Professional, SRF -From the desk of Division of Agricultural Extension, ICAR – Agricultural Technology Application Research Institute (ATARI), Zone – IX, Indian Council of Agricultural Research, JNKVV Campus, Adhartala, Jabalpur, official recruitment notification PDF is released for Walk-In-Interview for recruitment of Data Entry Operator, Senior Research Fellow, Young Professional – I, and Research Associate etc. There are various essential educational qualifications and desirable requirements for ICAR ATARI Recruitment 2018. 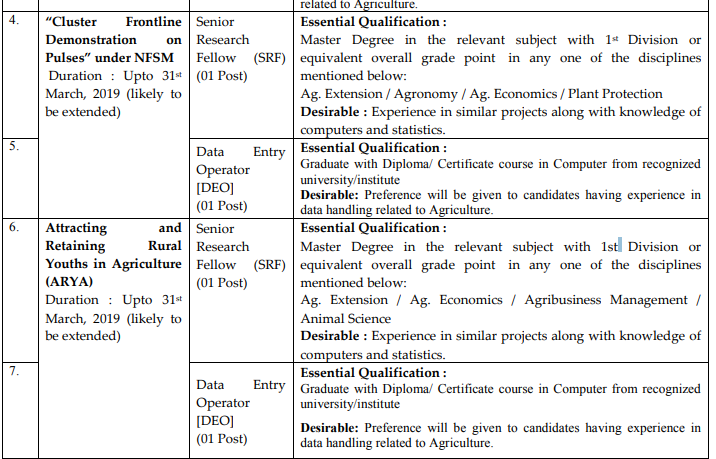 Projects for which, this hiring on contractual basis will lead to are – Farmer first Programme (FFP), duration upto 31st March 2019 (likely to be extended); Second project name is – Cluster Frontline Demonstration on Pulses, Under NFSM, duration is upto 31st March 2019, likely to be extended; Attracting and Retaining Rural youths in Agriculture (ARYA), duration upto 31st March 2019 (likely to be extended). For the post 1 and 4, date of interview is 8th October 2018. And, for the post of 2 and 3, date of the interview would be 9th October 2018. Although age relaxation will be given to the candidates belonging to Scheduled Caste, Scheduled Tribe and Other Backward Class candidates. Yet, 40 years for women and 35 years for men is the maximum age limit for the post 2 and 4 and 40 years for men and 45 years for women is the maximum or upper age limit for the post 1. All the job volunteers and appearing candidates just need to keep in mind that 01 vacancy, 03 vacancies, 01 vacancies and 02 vacancies is there for Research Associate, Data Entry Operator, Young Professional – I and Senior Research Fellow – 02.